Christine Kalt received her bachelor of science in nursing (BSN) from University of North Alabama in 2008, and master of science in nursing (MSN) with the focus on nursing education from Walden University in 2011. 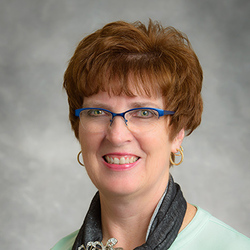 Christine continued her professional education and received her doctor of nursing practice (DNP) from Walden University December 2018. Christine joined Aultman College in 2009 as an adjunct clinical instructor, and then became a full-time nursing faculty in 2010. She was awarded associate professor in 2018 from Aultman College. Mrs. Kalt’s primary responsibilities include coordinating and instructing students in Medical Surgical Nursing IV. She coordinates and facilitates the nursing preceptor program. She is a member of several college committees and task forces that contribute to supporting the college mission, vision, and values. She has contributed to nursing practice research and has published of two of her nursing practice research. The first is titled “Primary Biliary Cirrhosis,” which was published January/February issue of MedSurg Matters, a nursing journal. Her second publication is titled “Clinical Nursing Faculty Competency”. This research was published December 2018 in ProQuest. She states, “Aultman College is very important to me, I chose my nursing career at Aultman Health Foundation because of its outstanding nursing history and quality care that the hospital provided to the community." She has 25 years of emergency nursing, and 10 years of forensic nursing before transferring to Aultman College. Educating nursing students is exciting and rewarding for Ms. Kalt. Through education, she feels that she is making a difference with every student she interacts with. By assisting these students to reach their personal and professional goals, they have the potential to strive to be the best nurse possible and make a difference in someone else’s life. She resides in New Philadelphia with her husband. Currently, she has two children and two grandchildren. In her spare time, Christine enjoys football, boating, reading, and traveling to warm environments.